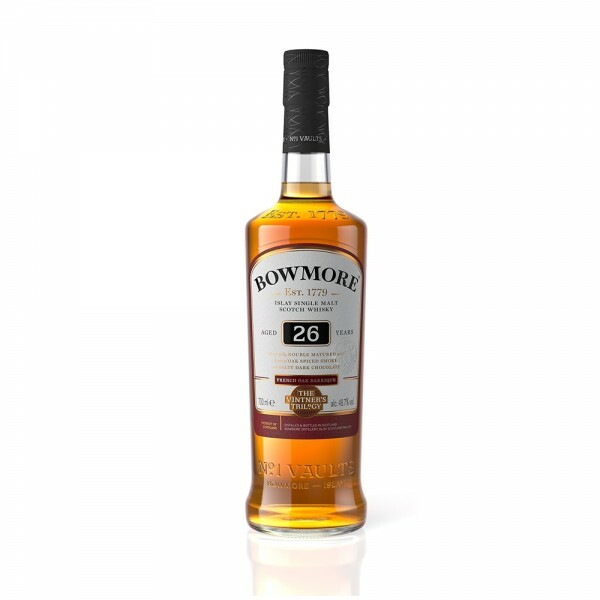 Bowmore Vintner's 26-Year-Old scotch is the second in Bowmore's exclusive Vintner's trilogy and shows how a wine-cask finish interacts with their smoky, coastal single malt. Matured in both ex-bourbon barrels and wine barriques, this limited edition release has taken on a burnt amber colour with aromas of redcurrant jam, camphor oil and cherry pie which intermingle with earthy smoke on the nose. Expect oak-spiced smoke on the tongue followed by salty notes of dark chocolate, raisins, and just a hint of brandied cherry.